By Raul Nuñez (IIEE) and Raul Gajardo Lepold. Thirty four years have elapsed since that experience. Their airtight silence and identities have been respected. It was only this year, thanks to the good offices of our correspondent Raul Gajardo Lepold, Major (Ret.) of the Carabineros force, that the couple has made us welcome in their home, given us their impressions, and more importantly, shared their hearts and minds with us, trusting in our discreet and respectful efforts. Between the months of March and April, of the year 1977, I believe, I was in my bedroom one night asleep beside my husband, L.R.P., 69, also an instructor of basic education, who retired in the year 1997. All of a sudden, around 3:00 a.m., I woke up frightened and startled on account of a powerful beam of light that lit up our bedroom completely, as well as sounds similar to those of gears in motion. The light seemed to come from the small window. I didn’t notice if the light was coming through the wooden walls, but the room was completely lit up. The window had shears and drapes. This is something I’ve never understood. I got up and kneeled on the bed, which was next to the window, facing west, and drew the curtains a few centimeters. I was surprised when I looked outside. In our neighbor’s back yard, some 7 or 8 meters distance, over the tops of two tall “paltos” (avocado trees) standing some 5 meters tall, there was an enormous object measuring between 4 and 5 meters in diameter, aluminum-colored, shaped like two deep saucers joined in the middle, where I could see something like a thick , broad machine base protruding around it, in its midsection. 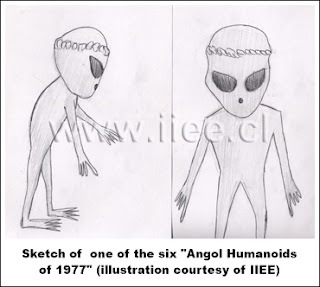 It had a triangular dome above it, conical, with multiple portholes on its centerline, which I estimated at 20-30 centimeters, spaced 10 centimeters between each other, and projecting powerful beams of light downward. Their colors were reddish, orange-ish and sometimes violet-blue. They looked like rays of light aimed at the ground, illuminating the backyard and home of my in-laws, who were my neighbors then, and are now deceased. Our own back yard and house were illuminated. [The properties] were separated at the time by an old wooden board fence, some of them open. I believe that those lights illuminated a radius of between 40 to 50 meters. Under the machine base, [the object’s] body was trapezoidal, with a flat base, unlike the upper, which ended in a point. The object looked like a little top, suspended in the air, static and not even vibrating. Its surface looked smooth to me, without joints or screws, almost molded in a single piece. A thick, solid and powerful structure. The dome must have been some 3 meters tall, perhaps 4 meters, and base between 2-3 meters, smaller than the former, in any event. I woke up my husband at that point and asked him to take a look through the window. I must confess that I was very frightened and felt self-conscious. But I went to the dining room, nonetheless, where there was a similar window, which just happened to face the object I was looking at squarely and directly. Both the dining room and the bedroom were completely lit. These rooms are some five meters distant from each other. A few moments later, once I was in the dining room, I saw that two doors, like sliding doors, were opening to either side on the central section of [the object’s] lower body. I immediately saw within the frame of that doorway, but somewhat recessed, the black silhouette of a large-headed being with large, almond-shaped eyes, but having a small, thin body, with large four-fingered hands. The index finger was the longest. Its legs were straight and its feet were long, “like frogman flippers”, dark grey, like slate. This little man made an odd, swift movement that I could not notice in detail, didn’t manage to catch it, not sure whether he crouched or not, but a sort of ladder began to come down or come unhinged, deploying itself as if step by step, slowly and gradually. It appeared to be made of a thin, black material, with trapezoidal steps, until it hit the ground. The small being then descended facing forward, in other words, with its back to the vehicle, one step at a time. That’s when I noticed it had stiff legs. They did not flex where the knees should have been. When [this being] reached the ground, another small being appeared at the doorway, and it began descending in a similar manner. A total of six small beings did this. The door remained open and the ladder remained hanging. The door had a width of some 1.5 to 2 meters, approximately. On the ground, the six beings roamed the back yard in every direction, in a disorderly, upright manner. I ascertained that their knees did not bend; they lowered their heads, which they were unable to turn. Their arms moved at their sides in unison with the movement of their wobbly torsos. With their arms detached from their bodies –somewhat raised and arched – they moved their hands and fingers quickly, using their wrists. On several occasions, two of these creatures stood face to face, moving their fingers rapidly. I had the impression that they were communicating among themselves. No ears were visible. Their skulls were very bulky in relation to their bodies, with something like protuberant bones in the upper parts and their temples. [The skulls] were lightbulb-shaped. Their eyes were almond-shaped, large and black. I never saw them blink. Instead of a nose, I saw something flat, and their mouths were like a small button with a central orifice. Their thoraxes were triangular in shape, tapered down to a narrow waist. Their legs were short, straight and thin, and their feet very long and blackish, as well as their hands. Their bodies appeared to be fastened into full-length jumpsuits, flat grey in color, seamless and slate-colored. I didn’t notice if they wore belts or anything on their backs, I only noticed they were somewhat “full”. Their gluteal area was flat or even, from where their legs emerged. Given that the six beings were wandering in every direction in the adjacent yard, the two dogs kept there would only whine and howl softly, evidently frightened. They were on the side of the house, where they slept, but then they fled from there. After all this time, which I estimate around 10 minutes, I had overcome the fear that those creatures had instilled in me. They were unhandsome, but very curious in their movements and way of being, and I took them to be intelligent, with a particularly developed sense of hearing. And so it was that I dared to open the dining room window curtain a little more. But at that same instant, all of the creatures placed themselves in front of the window I was looking out of, but at the other side of the fence, and the lights of their craft lit up the area I was in even more strongly. That’s when I felt fear, and I squatted to avoid being seen, but the room was fully illuminated. I could even see my fingernails. I almost didn’t breathe or move, until I plucked up enough courage and slowly rose to look out the window again. I discovered that in the yard, below the window where I stood, one of the creatures was walking past, as though trying to track my presence. I got a good look at that moment. I was no taller than 80 centimeters tall, cute as it walked, since it projected the impression that its head was too heavy for it. They seemed like friendly creatures to me. I felt as if fear had given way to friendship and I was fully relaxed, very calm. I didn’t see how that creature passed onto the next yard. I kept looking as they left. I started going up the folding ladder, one by one, facing the craft, as a man would normally do. While one ascended, the others kept watch at the bottom. Until all of them re-entered the craft. Before this, I should say that as they walked on the ground, I glanced at their vehicle, especially the sliding door, which had been left open. All that could be seen was a white interior, as bright as an illuminated tile. When all six beings were aboard the craft, a silhouette became visible at the door once more, to bring up the collapsible ladder. I didn’t see how he did it, since [the ladder] folded itself up little by little, until it was left within the craft’s inner edge. The door then shut from the sides to the center. The lights became as bright as day, and the craft began to rise slowly and vertically with very little noise, about two meters. Suddenly, there was a sound like a firecracker, but louder, and it flew off horizontally toward the north, as if toward the “Húsares” Regiment. The lights turned off as it flew off at an inconceivable rate of speed. Everything went completely dark, as there was no moon that night. The silence was so deep that I returned to bed with a strange sensation, a joyful one, arising from what I had seen and experienced. I slept soundly until the next day. I woke up around 9:00 a.m. – I got up and my curiosity was such that the first thing I saw from the dining room window was that the tops of the avocado trees were scorched. Their dark-brown leaves were wilted. It was only then that I fully realized what had occurred that night. The avocados never again produced fruit. They began drying up very slowly until they were cut down. One of the whining dogs died shortly after, without having been sick at any point. It was the one that was closest to them, because [the creatures] stood where the little dog stepped. I was aware of this, that’s why I can tell you about it. I told all this to my husband, but he gave it no importance. He was left with the idea that I had imagined it all. But many years have gone by since then – twenty-six – and I remember it all as clearly as if it had occurred yesterday. I could add this as a conclusion to the experience. At the moment when I had those beings so near me, I felt so happy, as if my body had lightened, become more sensitive to everything. Over time I’ve noticed that my mind is so clear, lucid and able to remember many details and memorable dates, more creative, but I’ve also noticed that I have lost much in the ability to remember faces.